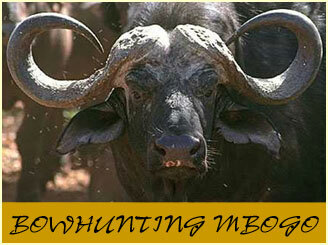 Mbogo, or Nyati, as he is sometimes called is said to be the oversized ancestor of the Spanish fighting bull. All the viciousness, hate and cruelty of the fighting bull, but wild and much larger. 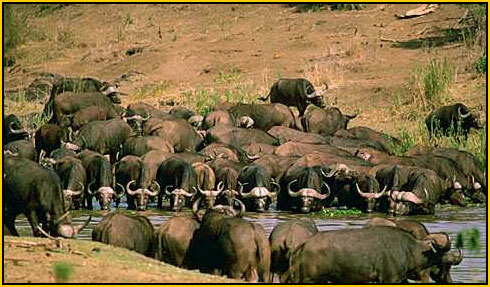 Mbogo is arguably the least predictable and most dangerous of the "Big 5", while also being the most hunted. From a bowhunter's perspective, besides being massive, they have an overlapping rib structure that makes adequate penetration from a quartering away angle very difficult. Waiting for a good, broadside shot is paramount. When wounded, Cape Buffalo are notorious for bedding down and waiting while facing the direction from which they came, oftentimes upwind of them. They will wait patiently until their aggressor is close, and then charge a last, violent charge that has unfortunately been the demise of many PH's and hunters over the years. An arrow wound, though it has the possibility of being effective almost instantaneously, can realistically take several hours to work, even when piercing both lungs, especially if using a narrower broadhead. For this reason, it is my opinion that unless completely sure the Buffalo went straight down, they should be followed-up at least four to six hours after having been arrowed and only with full rifle backup. If it were not for the "sweet spot" the Cape Buffalo has, it would be a very unlikely prospect for most bowhunters with traditional tackle. The "sweet spot" is a melon-sized area located straight up the middle of the front leg to a point that is about 35 - 40% up the body, and in line with the bottom of its' neck. If shooting broadside, the arrow will go straight through with little resistance, taking out both lungs and probably the top of the heart. This might seem surprising when one looks at this large animal as the shoulder looks quite imposing, but it works beautifully. There are basically two ways to hunt the Cape Buffalo with a bow: using the traditional spot and stalk method, or from a ground blind at a watering point or food source. Having just welcomed my first son into the family three weeks before my hunt, the high-adrenaline, but riskier spot and stalk method was not in my plans for this trip, or so I thought. I ended up hunting from a permanent ground blind at a watering point. There was a group of old "Dugga Boys" that came to water at this point on a regular basis and it would be just a matter of time before our paths would cross. With the new moon in our favor, in all likelihood the Buff would be coming in during daylight. On the first day of hunting, we had two bulls come in. One was a very respectable bull with horns about 38" wide, and the other was heavily broomed and what is sometimes referred to as a European-style bull. They were within range, but never presented the perfect shot angle we were looking for. They ambled around a little bit and then one of the bulls turned in our direction, raised its' head in an arrogant, taunting manner and looked straight at the blind. It had caught a whiff of our scent and the game was up. Both bulls quickly departed eliminating any chances we might have had that day. We spent three more days waiting patiently at the same waterhole. Buffalo came to the waterhole including several bulls, but the angle was never quite right or there was not a clear shot. Finally, I got what felt like a perfect shot opportunity. The bull was standing broadside only ten yards away. With darkness quickly approaching, I picked out a spot of mud on his shoulder right over the "sweet spot" and released my arrows. The bull kicked its' hind legs in the air as the arrow went all the way through his vitals and lodged in the opposite shoulder. With darkness upon us, we decided to follow up the spoor the next morning. We were out looking for the bull right at daylight. It was not long before we found the bull about 400 yards from where I had shot. Humbling us immensely, the bull was still standing, though with little strength. The entrance wound was clearly visible and exactly where I thought it was. Later autopsy would show this first arrow to have gone through both lungs. The decision was made for me to attempt to put another arrow in him. I eased in slowly, not knowing if there would be a charge or not. My PH was on backup, just in case. At 35 yards, I pulled back my bow and released another arrow. It flue true, hitting the "sweet spot", and exiting completely on the other side. As the bull struggled and moved off slowly, I was able to get yet another good arrow into him. With this hit, the bull ran a short distance before piling up dead. A classic "death bellow" confirmed we were safe. I was very thankful to have been able to harvest my bull cleanly with archery equipment and thankful that the follow-up shots did not turn violent. For a moment, the tables could have easily turned and that buff could have charged. Fortunately, it worked out and is now only a fond memory. 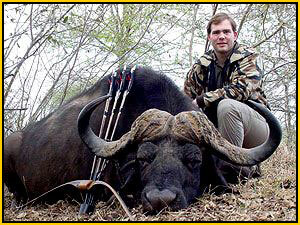 I hunted my Cape Buffalo with a 77# Harrison Black Wolf Longbow shooting arrows in the 1,025 grain range. I used a narrow broadhead, but found that as long as the hit was in the "sweet spot", a wider broadhead would have worked and not had any penetration problems. I actually feel that the lower angle of attack on the narrower broadheads allows some of the tissue to slip around the blade instead of being cut. The higher angle of attach on a wider broadhead such as a Magnus I is more deadly, in my opinion. I concluded after my hunt that a high performance traditional bow with a minimum of a 75# draw in the hands of somebody with at least a 28" is adequate for a Cape Buffalo, if hitting the proper spot. If one hits the overlapping ribs, 90# or more would probably be necessary. Arrows should be as heavy as one can get to fly properly and with a narrow shaft diameter. 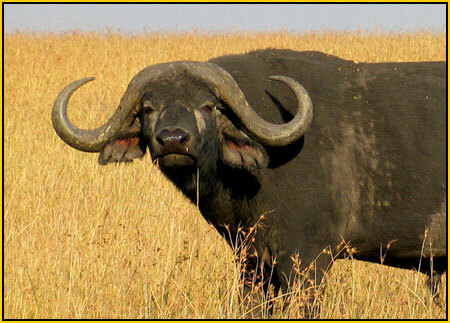 I used Forgewood shafts on the Cape Buffalo and was very pleased with their performance. The only thing I would change from my setup is to have a much wider broadhead that would hopefully cause the animal to expire more quickly. A double-lung hit with a narrow broadhead was not enough to bring the Cape Buffalo bull down immediately as I would have liked.